The time has come for yet another company to attempt to make a successful game in the Alien science fiction franchise. Recent attempts by Borderlands developer Gearbox have proven to be one of the biggest black eyes in publisher SEGA's history, and it has promised to make amends with this newest title, Alien: Isolation. Despite the new development studio behind it, Total War's The Creative Assembly, the hype and description of the game does not sound altogether different from the infamous Aliens: Colonial Marines. 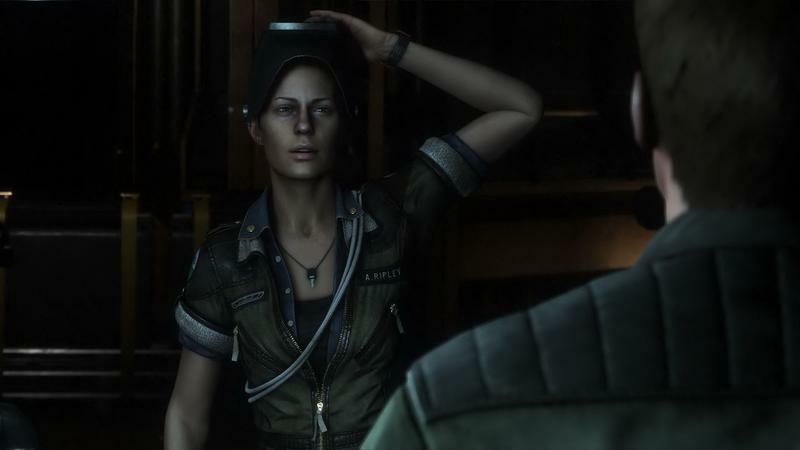 SEGA has touted a smart xenomorph creature within the game, playing up its ability to learn from the player's tactics and adjust itself to approach its hunt for Amanda Ripley. The developers claim that it is always constant and lurking somewhere in a level, and let's not forget the air ducts. All SEGA Alien games have to have air ducts to hype. There's been a lot of excitement about this game ever since it was first announced as the "Alien game to finally get it right," and pre-release responses have been nothing but glowing. How does the final product hold up? Is this the Alien game we've all been waiting for, or does SEGA and The Creative Assembly's latest come up short? I was all about this game ever since it was first announced. I like the studio behind it, and I saw immediately that the developers were trying to adapt the trends from recent indie horror games like Amnesia: The Dark Descent and Outlast into a wide release franchise. Simple art direction and a smart alien creature, I thought everything would fall into place with this game. I listed it as my most anticipated game of the year after E3, so I had a lot of expectations going into it. How did you feel about this game before playing it, Eric? I'm a huge fan of Alien and Aliens. So much so that I even volunteered to review Aliens: Colonial Marines despite knowing it was probably going to be a clunker. I wanted to like it that badly. With a different studio and concept behind it, I've been following Alien: Isolation since it started to gain steam on the preview circuit. I'm wary of any Alien game – we hadn't had a good one yet, before we started getting information about Isolation – but my hope going in was that this one might understand what the movies are actually about, not what games have taken from them repeatedly since they started picking up enough fidelity to imitate them: space marines and pulse rifles, primarily. I've had a bit of trouble getting into some of the other horror games you'd mentioned (despite being a lifelong fan of Silent Hill and others), so I hoped Alien: Isolation might be my point of entry into first person horror. Yes, at the very least it sounded different from previous AAA survival horror games like Dead Space and modern Resident Evil, which translates "survival horror" as "scary action." As for the final results though, I'm going to side with those two examples as simply being more fun. Alien: Isolation is a decent enough game with a solid enough premise behind it, but it doesn't always live up to the ambitions it sets up. For example, the alien itself at the very center of this game fails (as often as it succeeds) to live up to the hype. The Creative Assembly told us about this beast, impossible to kill, trick or outsmart, saying that it always learns from your tactics and always has an answer to whatever you throw at it. They claimed that it was always lurking somewhere in a level looking for Amanda, and it would not stop looking until it found her. However, the alien I often found myself at odds with did no such things. I easily outsmarted it by simply ducking behind a couch or crawling under a desk in plain sight, and it would just walk right on by, not even bothering to pick up on noises happening below the table. It doesn't lurk within the level at all times, and will straight up vanish when leaping into an air duct in the ceiling. I'll admit that it's creepy when the monster is acting as expected. There are plenty of times that it feels ever-present, and I wasn't safe at all. If it did get a kill, however, it was often a matter of luck when it would stumble across me in a room that had few places to hide. Once you get the flamethrower or even sooner, learn how to make molotovs, however, it's all over. That thing doesn't stand a chance against fire, and the sense of helplessness the game's tension rides on goes up in cinders. Amanda Ripley is not helpless in the face of this beast at all. It is true, though, that the alien is unkillable and that that is, in itself, unnerving. And they did work in a bunch of cool little touches to make the alien feel smarter. The noise from the motion tracker can attract the monster, for example, making it something you'll want to use sparingly. My biggest problem with the alien is that it outright cheats at times. I accept that video games glitch out, but some of the gifs I've seen in the last week or so have shown in different ways how the alien isn't a persistent being. I remember one in particular showing the player watch the alien stalk past a doorway at the far end of a room and then suddenly stab the player through the back as if it had teleported. The alien started out scary, but quickly stopped being a character and turned into just an obstacle. It was a set piece instead of an adversary. The truly terrifying creature aboard the Sevastapol station wasn't the alien, but the Working Joe androids that populate so many parts of the station. These androids aren't like Bishop or Ash from the movies. They look more like mannequins; except with red glowing eyes that tell you they're ready to smash your head open against the nearest corner. Somehow the fact you can kill the androids makes them even scarier. You know you'll have to go toe to toe with one of them at some point, but you also know, once you try to put a bullet in one, that they don't exactly go down easily. You might walk away, or you might not. And even before that, once you've been spotted, the way the androids act and speak is disturbing as well. They seem to be mildly irritated that you're there, and they taunt you, saying, "I can do this all day," but in a voice closer to Hal 9000 than a human. They have these weird twitches, too. They'll shuffle in place for what seems like no reason at all. It's not a glitch; it's just creepy android behavior. Yes, these androids are far more frustrating than the alien itself. They often "team up" with the alien in that they make noise choking you, and the alien swoops in to finish you off once you manage to get free. Nice touch with that one. The androids take several headshots to bring down, and while that might be an easier task in other shooting games, Alien: Isolation also forces Amanda to refocus and re-aim after every shot fired. That makes sense in the context that Amanda is not a fighter, so no complaints about that mechanic. The problem with fighting them with guns, however, is that you have to wait for their reflex animation to finish before taking another shot. Three quick shots to the head will only register the first bullet. I'm not sure where the other two bullets go, besides clearly into their heads as the bullet trails, impact animations, and the fact that I was at point blank range indicate, but this is a rough edge which makes them more unnecessarily frustrating than it has to be. Be it the alien glitching out or bullets that simply don't register, there are plenty of small things that make this sometimes frustrating game even more frustrating. I like a challenge, and Alien: Isolation feels like a wonderful challenge when it is working like it should, but too many cracks in the combat hold it back from reaching its full potential. The game feels a little rushed in these regards. The mission structure also leaves a bit to be desired. More often than not, Amanda is tasked with using her engineering skills to restart a breaker or lock some doors or do something with her profession. Traversing hallway after hallway after hallway to simply interact with a computer at the end grows very dull, very quickly. What does she do when she starts the generator? She has to find another computer to start with the working power. Then she has to talk to a guy stuck behind a door, and she'll have to rework the computer to open it. Over and over and over. Alien: Isolation is home to some decent level design, which can spice up your approach to the computer, but why bother? As mentioned before, the alien is not that difficult to get around, and more often than not, a direct path from point A to point B is the most effective. The game also touts a certain level of "metroidvania" design if you will, unlocking tools and using these tools to open doors. Bolt cutters, plasma torches, and the hacking tool, all of which have updates scattered throughout the world, simply exist to grant access to other locations. What do you find behind these doors? A nametag of a dead crewmember or another upgrade to open even tougher doors to find more dead crewmember nametags. Completionist fodder and nothing useful to help Ripley take down her enemies or even remotely fun to toy with. Crafting comes into play when you want to make expendable items like bombs, medical kits, molotovs, noisemakers, and EMP grenades. You can pick up random scraps and tools to make these items, but more often than not, your inventory will be overloaded with these ingredients because the weapons made aren't exactly practical. Molotovs work on the alien in a fix, and maybe a pipe bomb is necessary to take out an android here and there, but by and large, these crafting items can go ignored for major portions of the game. While the gameplay comes up short in a lot of areas, I think we can both agree that The Creative Assembly nailed the atmosphere of the movies perfectly with this game. I'll leave that to the bigger Alien fan to discuss though. 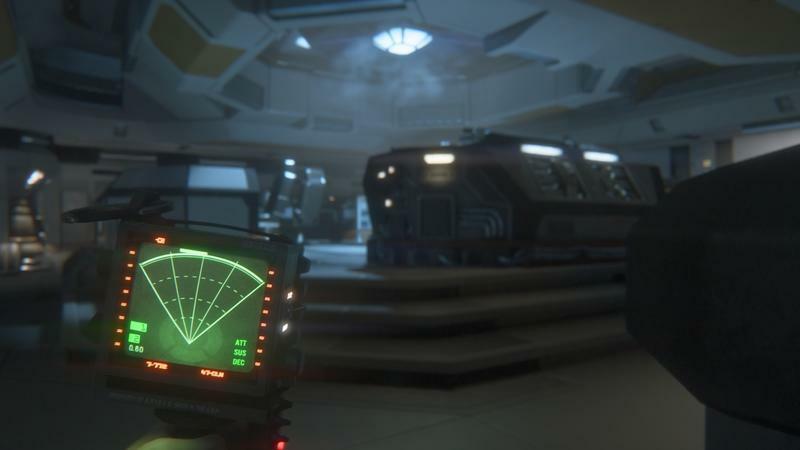 The aesthetics are, undoubtedly, where Alien: Isolation shines the most. As much as I didn't terribly enjoy my encounters with the alien itself, I loved exploring the space station. As much as those tools were just there to open doors, they were also there to, yes, open doors – to see a new room that felt lived in. The whole space station feels like that, in fact. In terms of just the art design, it's easy to see that not only does the team behind Alien: Isolation love that first movie, but that they were willing to put in the work to show it. The re-creation of that sort of early 80s futuristic style is perfect. Monochromatic CRTs operate the machinery of the station and tube televisions dot the lounge areas, complete with rolling scan lines. You could almost just take the space station on its own, without any of the hostiles, and it would be plenty scary on its own. Finding a place that just recently was so populous now nearly deserted feels wrong, even when it's inside a game. And then there's the sound. This might be the single best element of this game. The voice acting is solid and gets the job done, but the music and sound design are what kept me in the world. The string-heavy soundtrack does a great job of setting the tone and its sparing use makes it all the more noticeable when it chimes in. It doesn't always hint at a threat, either, so you're left wondering whether or not you're safe. The androids and the alien itself are great; too, whether it's that creepy, uncanny valley voice emitting from the android or the sound of the alien crawling in the vents. In one of my favorite moments, I was hiding under a desk waiting for an android to walk by and I kept hearing this sound – a nasty dripping sound. I looked around from my hiding spot and finally found the source and looked up. If I'd taken a wrong step out of my hiding space, I would've been the next vessel for a new egg. In that moment, I was living out one of my favorite movies; I felt grossed out, vulnerable and smart all at the same time. I wholeheartedly agree. I went into the game thinking that the alien would be the star, but left best remembering the atmosphere and the idea that I was walking around in an actual space station. The Creative Assembly's setting keeps its art direction and layouts relatively simple, and that works to its advantage. It feels like an organic, natural experience walking through its hallways. However, like I mentioned before, there might be one hallway too many. I like Alien: Isolation, and I believe there is a wonderful little game packed in a bulky AAA package. Cut back on a few of the forced action segments later in the game, like when Amanda picks up a shotgun and is told to go to town on the androids. Cut back on a few of the extended hunts for computers and switches, cut back on re-treading steps through old places, and maybe even cut back on the number of missions (and plot twists) altogether. I really got tired of flipping levers and turning on computers by the end of this game. The Creative Assembly probably wanted to make this a much shorter game, but it might have felt pressure to drag this one out to match a AAA requirement of about 20 hours to justify the $60 price tag. Way too long for a simple game like this. They had the right idea on how to take on an Alien game, but really needed to trim around the edges; pick up the pacing, work out the bugs, really hone in on what makes this game great, and it could have been smash hit at a smaller price. Disclaimer: We purchased one copy of Alien: Isolation for PlayStation 4 and received a retail copy from the publisher for Xbox One. We both completed the primary single player campaign before starting this review.